As a child I loved tea with Aunt Ida. There were real cups, white linen napkins and a flower on the table. I loved community strawberry teas with biscuits and whipping cream. I am not alone in my love for tea. Anyone who has witnessed a formal oriental tea ceremony knows the deep respect given to this honored tradition. A journal is not a substitute for a friend. Yet, it is a friend. It is a place where I befriend myself – where I go to listen, to explore, to wonder what I am doing with my life.. 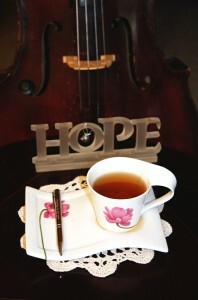 Tea for the Inner Me combines my love of tea, my commitment to journalling and my experience as a psychotherapist. Tea for the Inner Me is an invitation to find that quiet and wise place within yourself by blending the ritual of tea and the practice of journalling. You don’t need to love tea or be enthusiastic about writing. You just need to be willing to experiment. It is our nature to be reflective, to ask ourselves, why and how and what if. A deep sense of quiet is often just a cup of tea away. In our culture, shops don’t close for tea. People don’t dress for tea. The person who has time for tea must be retired! Or underemployed! It is a badge of honor in our culture to be stressed, to eat on the run and to use beverages that stimulate, rather than ones that soothe. A tea bag in a mug is not Tea for the Inner Me. It is not easy to take time for tea, to sit down with one’s self. 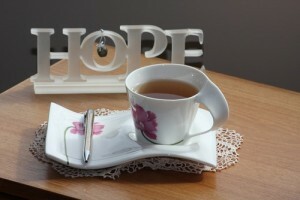 To take the extra moments to steep tea, perhaps to use loose tea, to turn off the radio or television, to sit quietly. To pose questions to one’s self. It is even more of a commitment to explore our world with pen in hand. a copy of the Tea for the Inner Me book. There is time for tea, time to write, time to share if you choose. No writing experience is needed. The process is guided and comfortable. This is also time to ask questions about developing your own practice – your own blend of tea and journalling. Tea for the Inner Me is not only for times of challenge and distress. It is a time to record and cherish those moments that bring us joy. Tea for the Inner Me is an invitation to take time to reflect on your life. Tea for the Inner Me is available as a unique gift package and personal experience for that someone special. The book Tea for the Inner Me is also available separately.